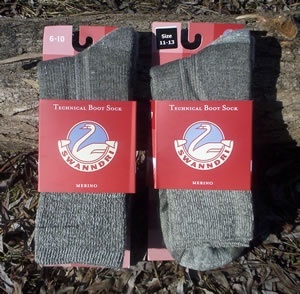 Swannie socks!. I’ve always liked merino blend socks, merino is comfortable and breathable and hard wearing and when you add nylon they are stronger still and lycra makes them fit beautifully. The Swanndri Technical boot sock comes from the legendary New Zealand clothing firm Swanndri and they have made an excellent sock, it grips in the right places and is soft in the right places, I’ve worn them continuously for months (errr, not actually the same pair) and they are comfortable and durable. Just the right thickness for hiking and walking and hunting ,fishing. They have nice comfort zones on the heel and toes that cushion the foot and are ergonomically designed to provide maximum pleasantness!. Hard wearing too, like the bushshirts, only softer, for your toes. Purchase through PayPal by using the "Add To Cart" button above or use the form below to order the Technical Socks by Swanndri . Feel free to contact us if you have any questions about the Technical Socks by Swanndri .